Porchon-Lynch teaches yoga four days a week, does ballroom dancing and guides wine tours in New York State (sounds like my kind of lady). And as if that’s not inspiring enough, she’s a great example that you can start any age and no matter what state your body is in. 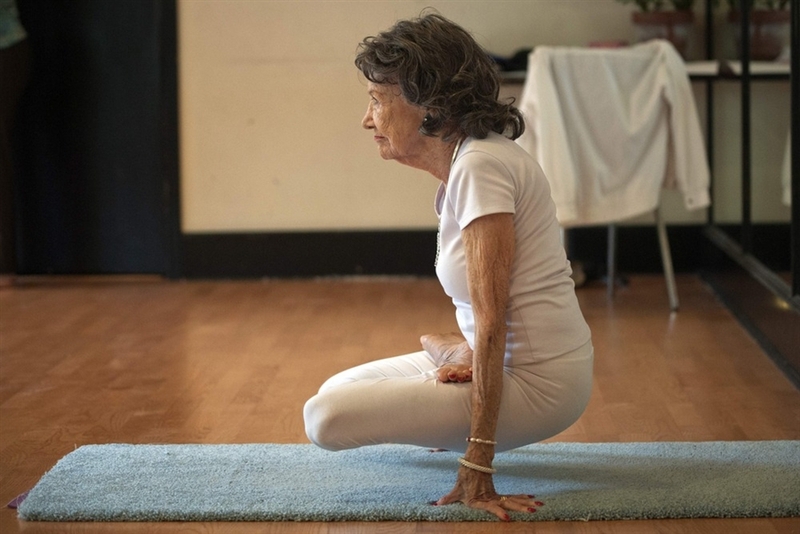 While she’s been practicing yoga since she was 8 years old, she didn’t start teaching until she was 73! 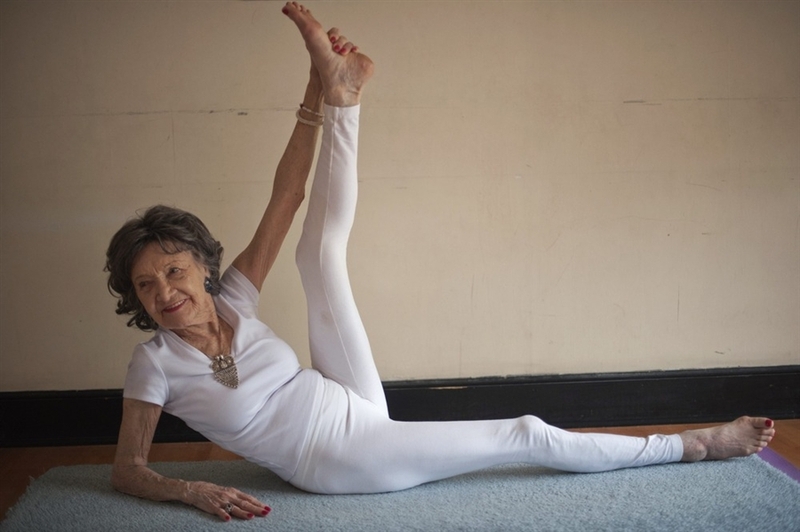 Further, at 87, she had hip surgery but a month later she started dance lessons. I believe that we can always reach just a little bit further,” said Porchon-Lynch. “I’m inspired to bring yoga into others’ lives along with helping people unearth new talents. It doesn’t fix things, and I still don’t feel great, but it helps to stop in the middle of a good pity party and remember what you have. It may seem like a counter-intuitive thing for a yoga teacher to say, but I’m a cynic and a pessimist by nature. I come from a long line of worriers and can usually find the worst case scenario in most situations. But I think that’s part of what makes me a good yoga teacher– I’m striving to not take things so seriously, I’m working on just being me in the moment, I’m no guru, I’m a real person (a jaded New Yorker with a friendly Midwestern core). They say when the student is ready the teacher appears. Well, one particularly gloomy late winter day this year, I was walking home from a yoga class feeling pretty sorry for myself and all that was wrong in my life, when I saw this book propped up on the steps of a brownstone. I’ve been reading The Happiness Project on and off before bed for the past few months, and I just finished it last night. It wasn’t life changing (well at least yet), but it did get me thinking, and I really appreciate her approach of research, theory, and practical implication. People (to a certain extent myself included for a long time) think that being happy shows a lack of depth, an innocence or naivety, while unhappiness or dissatisfaction is “cooler”, and smarter. But in reality, it’s so much easier to complain than to be satisfied, to be discontented or ironic than to be enthusiastic and smile. Especially when life is handing you lemons, making lemonade is not effortless. Being lighthearted is sometimes a difficult pursuit, but maybe that’s what the real idea of the pursuit of happiness should be–not that we should strive for some home and car ownership dream of happiness, but that we should endeavor to be more appreciative beings, easier to please, and quicker to forgive. I had a unique opportunity today; one of my fellow newly minted yoga teacher friends is also a trained budokon teacher, and was asked to give a special class at Joschi Studio for a few of us. Just what is budokon? In a nutshell, it’s a mix of yoga and martial arts with some animal movements thrown in (a more in depth explanation here) Here’s a video that includes some of the movements we learned today. It helps tremendously to come to budokon with an understanding of yoga movements as many are included, but there’s also quite a bit of reframing your muscle memory of how flows and poses go, since it’s not quite the same. At first a lot of the hopping and switching sides and legs and arms was a little confusing, but like anything with a little repetition it clicked a little more and when we sped up the flow, I started to have fun and even feel a little badass. But boy o boy is it a workout, this isn’t really a practice that you can come into without some sort of movement in your life already. After almost an hour of various fighting stances, we ended the class with animal movements, which was, while still strength and agility building, pretty fun and playful. Mats aside, we moved back and forth across the room as gorillas, chimpanzees, frogs, and other animals. I could see incorporating some of budokon’s take on yoga poses into my classes (especially the roll through to plank from down dog), and the animal movements seem like a great way to snap people out of taking themselves so seriously and play with their strength. Booker is a great teacher and will be subing the 1:30pm Sunday flow yoga class at Joschi and incorporating some budokon in, I’m going to try to check it out again. This isn’t what I planned to write my second post on (I was thinking about explaining why I love pigeon pose). But that is a lesson in teaching yoga, and living life: make a plan, and being willing to change it. So much of yoga is about feeling good, challenging yourself, and being present, but it can be too (both in the practice and in teaching) about finding hope when living in despair. And before the hope comes, when there is just despair, yoga can be about sitting with that pain, breathing into it, knowing that it will pass, and that when it does it leaves the potential for something beautiful to be born.